Frances Elizabeth Caroline Willard, 1839–1898, American temperance reformer and suffragist; 2nd President of the Women’s Christian Temperance Union, 1874–1898. Autograph Quotation Signed, Frances E. Willard, one page, 5” x 8”, on stationery of The Priory, Reigate, [England], March , 1895. Accompanied by: Anna Adams Gordon, 1853–1931, 4th President of the Women’s Christian Temperance Union, 1914–1922. Typed Letter Signed, Anna A. Gordon, one page, 8¼” x 11”, on stationery of the World’s Women’s Christian Temperance Union, The Cottage, Reigate, [England], March 21, 1895. 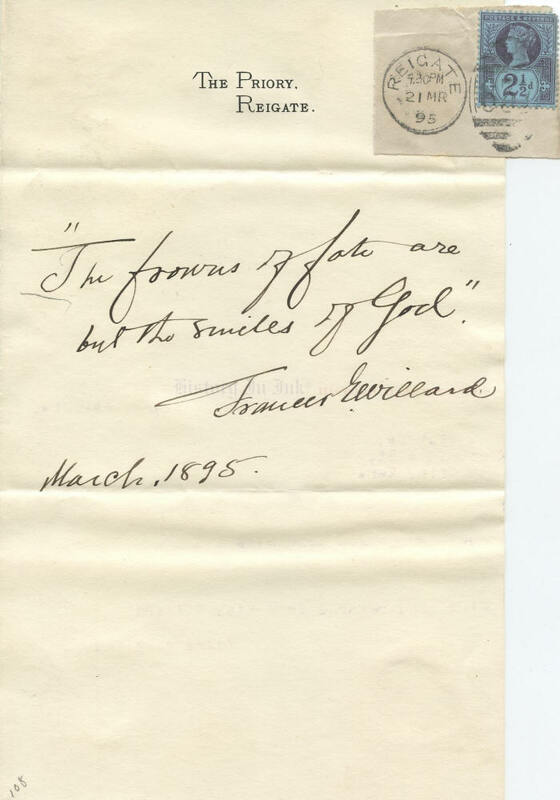 Willard, the president of the Women’s Christian Temperance Union, sends a handwritten quotation in response to a student’s request. She writes: “‘The frowns of fate are but the smiles of God.’” She dates the piece March, 1895, below her signature. Willard replied to a penmanship student at the State Normal School in Emporia, Kansas, now Emporia State University, for a holograph sentiment, reminiscence, or word of advice to be included in albums devoted to the handwriting of prominent people. The penmanship professor compiled the responses to his students’ letters into several albums, which we acquired. This piece therefore has never been offered on the autograph market before. Willard became the second president of the WCTU in 1879 and held the position until she died in 1898. She became associated with Lady Henry Somerset, a British temperance leader, and she and Gordon spent a year with Somerset in England. The stationery of The Priory at Reigate is from Somerset’s home. Gordon was herself an important figure in the temperance movement. When Willard died, Gordon became Vice President of the WCTU, serving with the new President, Lillian M. N. Stevens. Gordon wrote a memorial biography of Willard that was expanded and reprinted a few years later. Upon Stevens’s death in 1914, Gordon became President of the WCTU, serving during the critical period of the adoption of Prohibition in the United States through ratification of the 18th Amendment to the United States Constitution, which prohibited the production, transportation, and sale of alcohol. Gordon resigned as President of the WCTU in 1922 to accept the presidency of the World Women’s Christian Temperance Union. Willard has written and signed her quotation in black fountain pen. There are two horizontal mailing folds, neither of which affects the text or Willard’s signature, although the bottom fold barely touches the bottom of one leg of the “M” in “March” in the date, and a stray pencil mark under the first letter of the quotation. It also has a small collector’s pencil notation in the lower left corner and a bit of soiling, the integral leaf has been removed from the letter in a slightly irregular fashion, and there are mounting remnants on the back. In addition, the postmark and stamp from the original mailing envelope have been tipped to a blank area of the upper right corner of the piece to record the March 31, 1895, mailing date. Gordon’s cover letter likewise has normal mailing folds, one of which passes through Gordon’s signature, scattered wrinkles, a small collector’s notation in the lower left corner, and mounting traces on the back. Both pieces are in fine condition.